This tree is in the side yard of my son and daughter-in-law’s house in Texas and I am fascinated by it. It’s a ‘live oak’. Live oaks are rightly named because they live a long time. I’m not sure how old this one is, but it is huge! I wonder over the past hundreds of years how many children have played on this tree. Did pioneers sit under its shade? Did it provide shelter from rain? Will it one day be a piece of furniture? 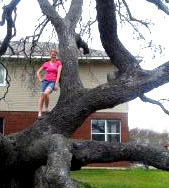 And, just in case you’re wondering, that’s not Zacchaeus in the tree, it is my niece. Zac climbed a sycamore tree. Zacchaeus was a wealthy, hated, tax collector who happened to also be short. Zac (I think I can call him “Zac”, we’ll be friends in heaven!) didn’t know at the time that God had big plans for him; he just knew that this new superstar, Jesus, whom everyone was talking about was coming his way. So this tax collector, this wealthy, hated, small man, ran like a child to get to the head of the line and climbed a tree just to see Jesus. He was working hard, in his own effort to just get a glimpse of Jesus. He didn’t ask for help. He didn’t climb on anyone’s shoulders. He just did what he thought he needed to do. But, he didn’t need to work so hard, the One he sought was seeking him. When Jesus reached the spot where Zacchaeus was, Jesus look up and said, “Zacchaeus, come down immediately. I must stay at your house today.” (Luke 19:5) Jesus didn’t climb the tree; he called Zac to come to him. And Zac came down and welcomed him gladly! Then, Jesus went home with Zacchaeus, which angered a lot of people! How could Jesus hang out with such a sinner? But this wealthy sinner had become a saved soul who was willing to give away everything for Jesus. Zac had found the greatest treasure; salvation in Jesus. Zacchaeus was a little man who climbed a tree. To what lengths are you willing to go to see Jesus? Are you willing to run in public? Climb a tree? Or, in other words, make a fool of yourself? If Jesus were to come to your house today, is there anything that you’d be embarrassed for him to see? Is there anything that you are not willingly to give up to know Christ more? What if giving it up meant someone else would come to know Christ as the Savior. When Jesus calls, will you come down from your perch? Out of your hiding place? Are you willing to step into a low position and serve others? Or are you afraid? Do you prefer looking at him from up in a tree? Okay now I can barely see thru my tears. Love this! One of my favorite scripture! I love Zacchaeus! I love Jesus! I love you! Thank you Marcia for sharing your gift with us!